Nothing beats a nice quiet dinner with good friends to help one de-stress from the rigours of work. The trio of entrees turns out to be an enticing balance of modern and retrospective bites. I love the wok-seared scallop topped with tiny eggplant dices and walnut oil for its harmonious blend of delicate flavours and silky soft textures. Memories of wedding banquets in the 1970s flooded back when I savoured the chilled terrine-like shredded farm chicken in gelatine as a similar version was the perennial favourite for the appetizer platter back then. Looking cheerfully bright like a mini sun, the organic carrot ball in pumpkin puree was springy to the bite but I felt somehow its subtle flavour was slightly eclipsed by the earlier duo I had sampled. Now I'm not big on soups but the double boiled shark's fin, chicken consomme and wood ear mushroom dumplings certainly hit the spot that night. I relished every drop of it and the warm comfort it brought. 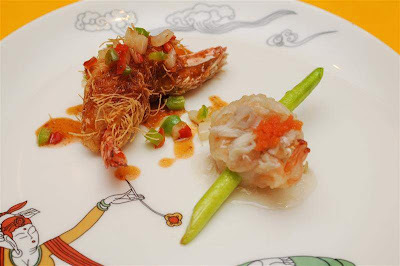 Just when I thought it couldn't get any better, the Yin Yang Prawns comprising a silver prawn ball pierced with a stalk of asparagus and crab roe sauce and a sizeable fried prawn wrapped in crispy kataifi pastry and drizzled with hawthorne berry reduction elevated our culinary experience to greater heights. What a fantastic melange of different nuances and textural constrasts! This is definitely one of those rare dishes that made me want to rave about it to all and sundry. This lamb's got a lotta bite in it! A hot, hot, hot sauce that combined ground Szechwan and black peppercorns literally set our taste buds alight when we bit into the lamb cutlet. It was the chef's version of Mongolian sauce and a darn good one too. Missing mama's cooking? These oodles of noodles will assuage any homesickness! 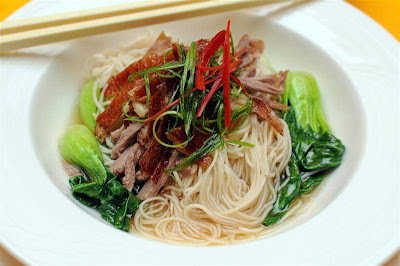 To temper the heat, a bowl of somen noodles laced with yellow sweet wine and five spice roast duck meat followed. It proved to be another retro-style delight that was truly soul-satisfying! 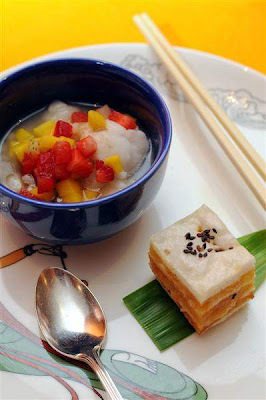 Although I was not too hot with the confusion of sweet-bland-tangy nuances of the barley sherbet with herbal jelly and mini tong yuen (glutinous rice balls), the pillowy soft salted egg yolk layer cake succeeded in warming the cockles of my heart. 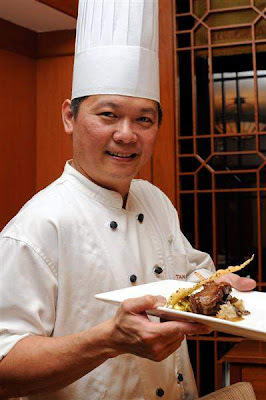 Chef Tan should be commended for his fresh approach towards some yesteryear's delights. 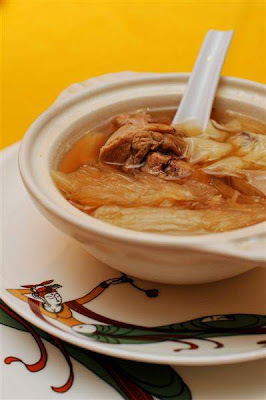 It seems there is currently a revival of sorts in our local Chinese culinary scene as diners are beginning to rediscover dishes that evoke nostalgic memories and give younger ones a taste of their rich heritage. I for one will be all out for it! Head on over to Dynasty Restaurant and savour this exquisite menu for the Malaysia International Gourmet Festival (October 1 - 31). 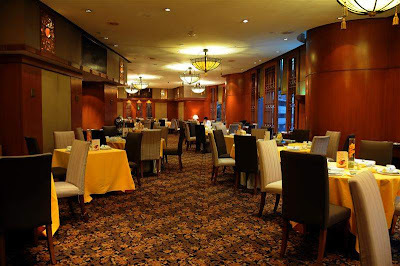 Priced at RM119++ (without wine). 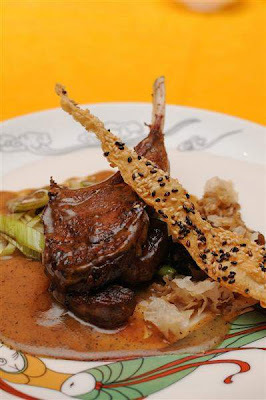 A 4-course Light Festival Menu is also available at RM88++ per person. When you spoke about the chilled terrine, how truly it was a 70's dish which you can hardly see this days. It was so lovely. 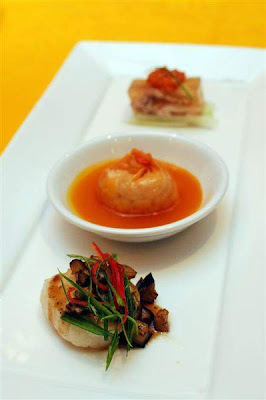 I had tried chicken dish with Mongolian sauce but it was not as good as what Chef Tan had created, just so perfect! That night was fantastic, having a quiet nite and yet a lay back over ,loads of catching up was just so awesome, something I don't get to do often.